What is a Firearms License? A firearms license or permit issued by any governing body, typically by the police, of a State or Municipality that allows the licensee to own, purchase, buy, posses and use a firearm. In Illinois where I reside this is handled through the State police. An application for a FOID card, (Firearm Owners Identification), is sent off to the State Police where a background check is completed. If approved, a FOID card is sent through the mail. This gives the average citizen of our State the needed documentation to be able to purchase firearms and ammunition. It also lays the liability of the proper gun storage, handling and adherence to the State laws upon the recipient. The permit or license scope varies according to what firearm(s) and or activity(s) it allows the holder to legally do with the firearm. For example, a license may allow the holder to engage in hunting, target shooting and/or collecting, or permit the holder to own firearms for self defense, carry a concealed firearm or operate a business (such as being a gun dealer or a gunsmith). Rifles, shotguns and handguns may require separate licenses depending on the jurisdiction. Our Great State of Illinois has separate permits for most anything that has to do with firearms. FOID card just to own and/or posses a firearm OR ammunition. Hunting licenses for each species that a citizen wishes to hunt (with an individual permit fee for each AFTER the purchase of a general hunting license). Concealed Carry Permit, if one chooses to do so…ONLY after you apply for and receive your FOID card. 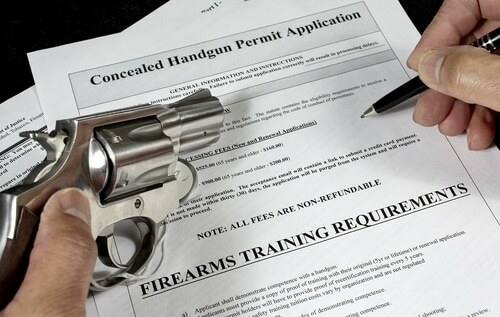 To say that it is mildly complicated is an understatement considering that at each permit point the citizen is responsible to know and understand all of the rules and regulations that apply to the exercising of each firearms License or Firearm Permit. Hey Buddy!, I found this information for you: "Firearms License". Here is the website link: https://thegunrights.com/firearms-license/. Thank you.